During the holiday season there are regular bus services between the main holiday resorts and places of interest. However, you will probably not be able to find a bus service if you are not located on one of the main coastal roads or high ways within Cyprus. There are many charter services that operate only during the holiday season. 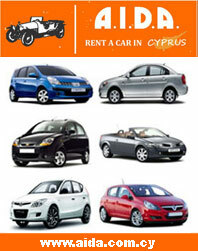 Cyprus Car Rentals offers an all year round service regardless of where you live. The option to use Cyprus Car Rentals to assist in your research on Cyprus or your search to find the right company offering the right service for you is yours and yours alone.